The Stones ranged between ragged and catastrophic, for the most part in Vienna, thanks largely to Keith. I'm not complaining: it was like an alcohol-free performance by the Faces. And I'm sure the 99% were too ecstatic to notice or care. Keith is like the Michael Phelps of rock. He needs to work on his starts. "Start Me Up," "Jumpin' Jack Flash," and especially "Satisfaction" all began on very wobbly notes. The intro to "It's Only Rock n' Roll" sounded puny - like something the Edge might play. 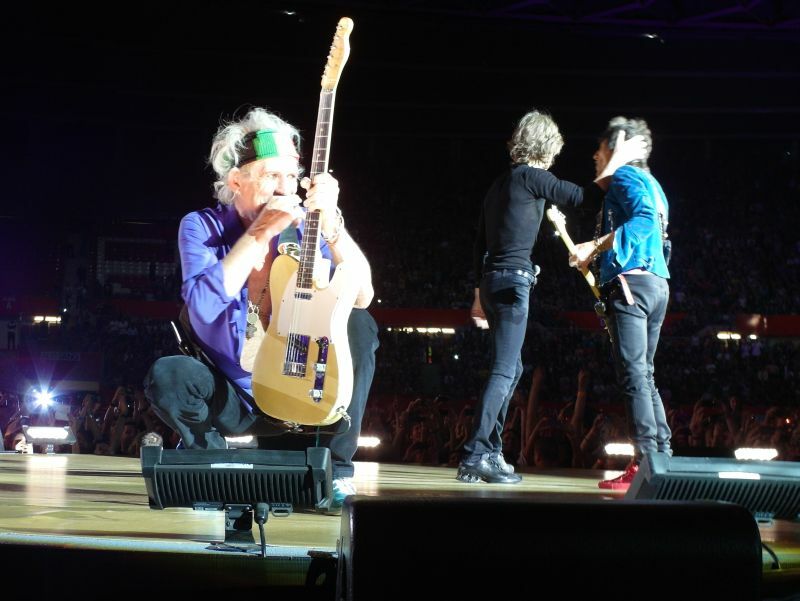 "Tumbling Dice" was OK, but Keith brutally interrupted Mick mid-sentence "auf Deutsch." Mick just kept mouthing the words from the Teleprompter as Keith played, and then had to look towards Chuck to get the right timing. Something was eating Keith. 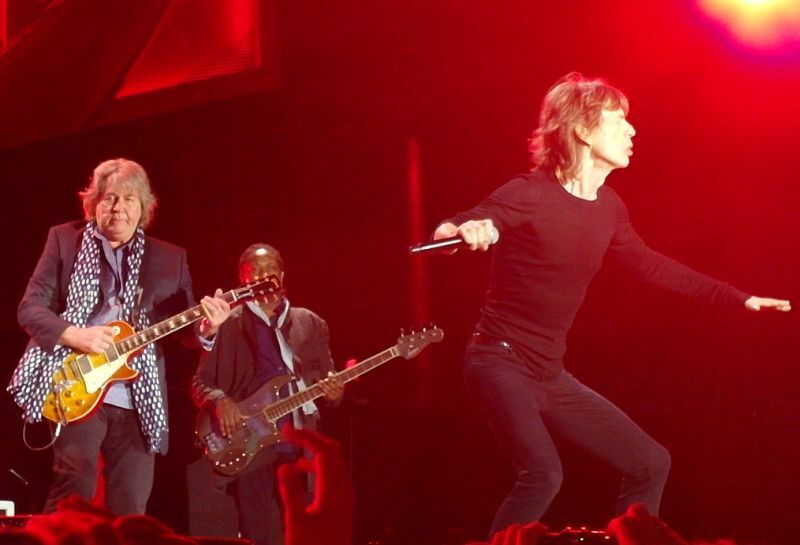 I don't think he was mad at Mick, though the two largely ignored each other with Mick spending a lot of time at the end of the catwalk. That's where he was when "Honky Tonk Women" ended, so he had to rush back to the Teleprompter in order to introduce the band. As for the catastrophic, well that was "Sympathy for the Devil." Charlie - described by Mick during the intros as "the whammer of Wembley" - just stopped playing and got up from his stool as the song was winding down. This forced Mick, Lisa and Bernard to end the song with some a capella woo-woos. I have no idea what happened. Maybe Charlie's click track died? It's 24 years since I last saw the Stones in Vienna, when Ernst Happel was known as Praterstadion. And I'm pretty sure they played "Angie" that time as well. Can't say I dug tonight's version, or the set list in general. The Internet "choice" was "Get Off Of My Cloud," the performance of which thrilled Mick. "Very nice. Like the old version. Still got a shine on it." Mick was in good spirits throughout, noting (I think) that it was the Stones' 14th time in Austria; joking that they practised what I assume is a local song called "Rise Like a Phoenix" for the Internet choice; asking if anyone was from Hungary, Croatia or Serbia - "One or two," he concluded; and congratulating the "fantastic" singalong on "You Can't Always What You Want" - "true to your musical heritage." I really needed this show to finish early because of tight train connections to my place in the sticks, so was a bit worried when "Midnight Rambler" clocked in at 13:45, i.e. 20 seconds longer than in Paris. And Darryl's bass solo in "Miss You" entered Geddy Lee wankfest territory, forcing Mick to motion to Bobby in the wings to get in place for the sax solo. And then Chuck decided to add a gospel-style coda to "You Can't Always Get What You Want." Ugh! Any other show but tonight. By the way, if that was the Vienna Boys Choir on stage, as some on iorr had predicted, then they looked hot in blonde wigs and cocktail dresses and I should probably discuss my modest arousal with a therapist. A city enjoying Stones fever! Vienna went completely crazy with the prospect of this Stones concert; it would be a wonderful evening with nice outside temperatures. Whomever I met during the last days in Vienna, they would somehow refer to the Rolling Stones. And if the vibe would not have been excellent by then, a pre-Stones party at the Reigen Club the evening before provided excitement to those who were not already tuned to Rock'n Roll. Austria's hottest Stones cover band with their Mick-Jagger-look-and-sing-alike frontman Hans Irker gave one of their rare concerts with a 3 hours set that included not only the warhorses but also treats such as Silver Train, Till the next Goodbye, Mother's little helper, Heart of stone, Cherry oh Baby, even You can't always get with a small choir. But then, the Real Thing. Fans lined up for autographs at a hotel representing the imperial style of Vienna in the afternoon. Outside conditions: nice, warm weather, without being hot, so excellent conditions for an open-air concert. Inside the stadium during the Stones show: Way beyond boiling temperature. 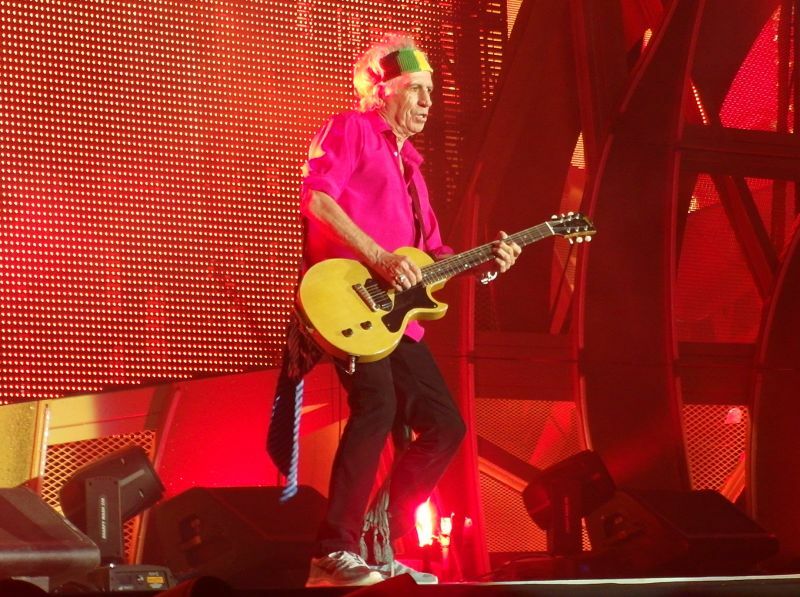 The last time the Stones were in town was in 2007 after Keith fell out of his tree, and after the tour re-start in Milano (Italy). 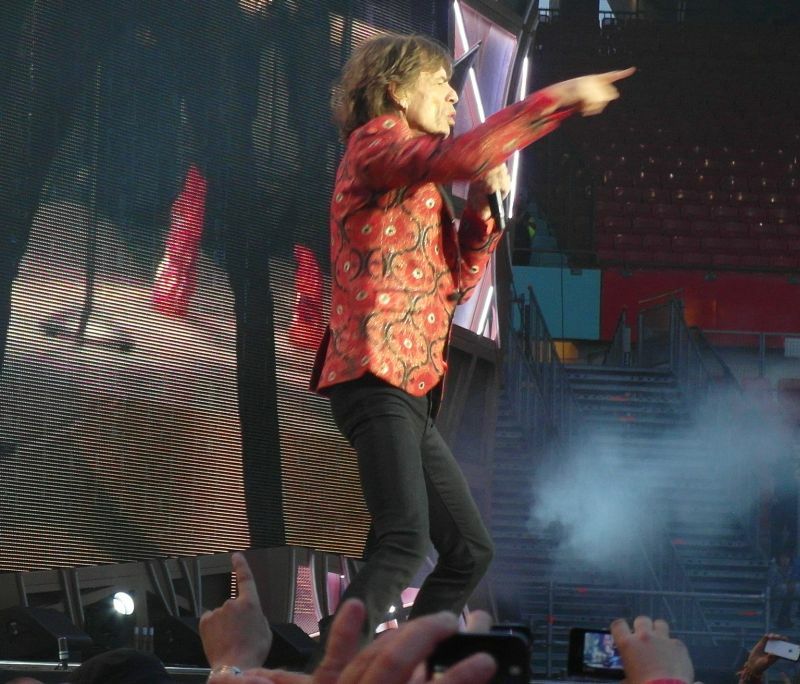 This concert was by then also considered one of their best during the European leg of the Biggest Bang Tour, so we all had good memories of the Stones playing the Ernst Happel Stadion in Vienna. And the Stones apparently also had these memories. I never heard or saw Mick Jagger talking that much in the local language, even shouting more than once "Geht es Euch gut?" (You doin' good? ), and greeting the audience in the local Viennese dialect ("Servus") and before the encore "Pfiat Euch" (which means, "God be with you"), or introducing Angie as "Was Romantisches, zum Kuscheln" ("Something romantic, to cuddle up"). And he made a joke about the Austrian winner of the Song Contest, Conchita Wurst, with her winning song "Rise like a Phenix", when he introduced the internet song choice Get off of my cloud. The Stones opened with an excellent version of Start Me Up, and the crowd including myself went nuts for the next 2 hours (including my two daughters, 9 and 11, and my wife). It seems that Vienna is definitely a special place for the Stones. I have the privilege of being able to compare the Vienna show with the one in Berlin (about a week ago) which was rightfully described on this board as an excellent show. But who could prevail over the Stones and put on a show which would be transcending any known rock concert experience, and turn a stadium into a club show? 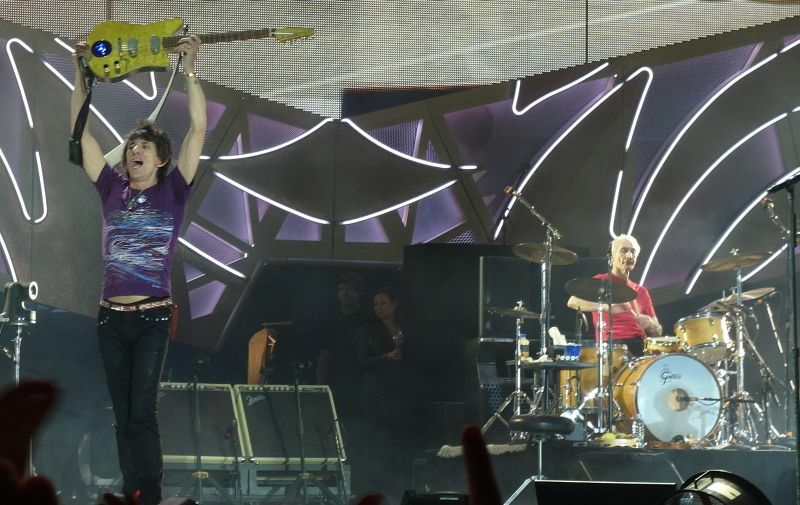 It could only be the Rolling Stones themselves, and they did that with their Vienna show. This is a band that managed to re-concentrate and re-focus in a way we did not see for a long time. 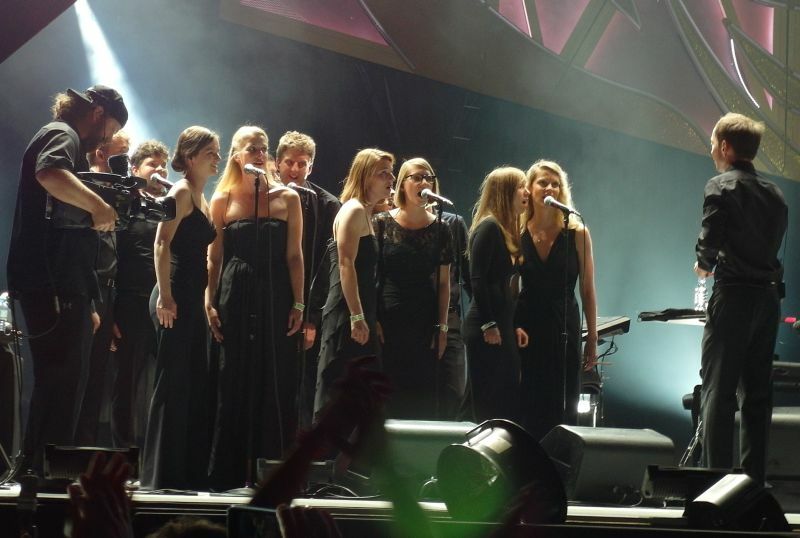 For about the first half of the show, nobody on the stage was looking too relaxed or smiled like in Berlin. The result was a show that was immaculate music-wise. Solos and licks were traded by Keith and Ronnie, often standing close to each other. No noodling, no rock star posing (at least none that would distract from the music), no gimmicks, just the pure music. The lack of the hugging and kissing in the first half was apparently not due to some bad mood in the band since the second half of the show was all smiles and high-fives. My favorites of this show are really hard to choose: We experienced a band that was not only on fire but allowed themselves to invite 55,000 fans for some extended solos and jams. 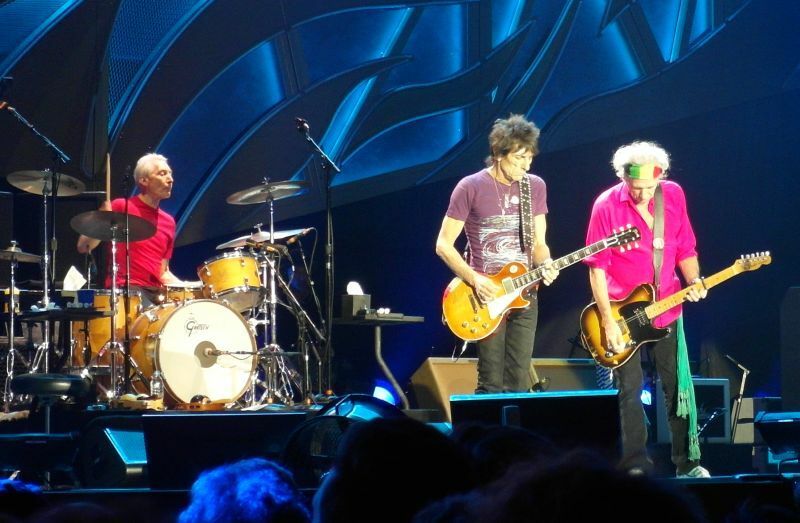 Some songs were much longer than usual especially by Keith extending his solos, not willing to stop the flow of music. 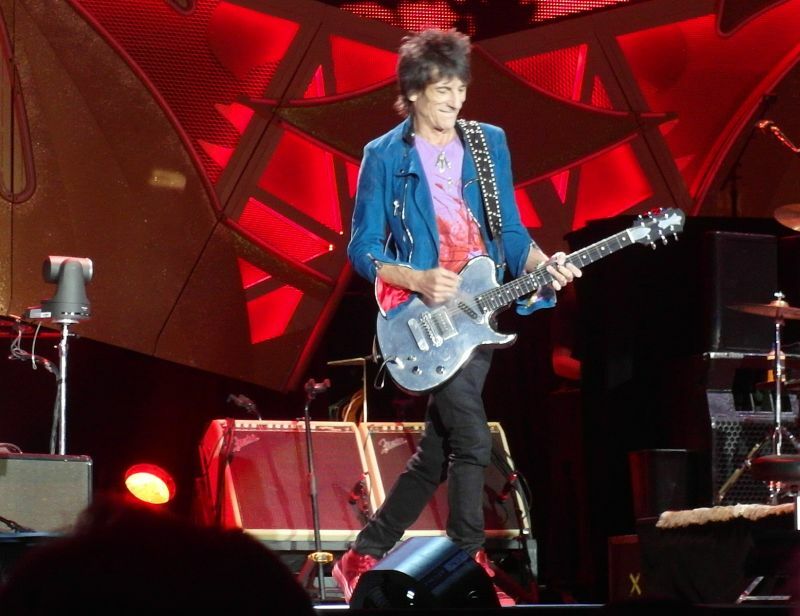 Ronnie contributed his usual solos, for instance, in Start me up without any flaws, he also shined in Midnight Rambler together with Mick Taylor and Keith. They really made this song stand out from the many excellent versions we heard so far during 2012 to 2014. The guitars were loud, focused, concentrated, just excellent and breath-taking. Even Sympathy for the devil, You can't always get (with the Wiener Singakademie), Brown Sugar were extended with more licks. The two acoustic guitars of Ronnie and Keith on You got the silver are just wonderful to watch, again Keith walking some extra miles on his guitar. He owns Jumping Jack Flash with his riffs, and he didn't stop playing extended licks during the last number Satisfaction. It seemed that 55,000 people, plus Keith, could wear out Mick Jagger who ran to his bottle of water during the encore to collect the last remaining bits of energy which he threw into the crowd. Charlie Watts and Mick Jagger: impeccable, high-energy, sheer magic. Who cares about some sloppy starts of Honky Tonk Women and Brown Sugar? Hey guys, this is a life concert! Am I only blinded by my enthusiasm because they played my home town? I wrote this report first, before reading the IORR thread and press comments on the Vienna show. 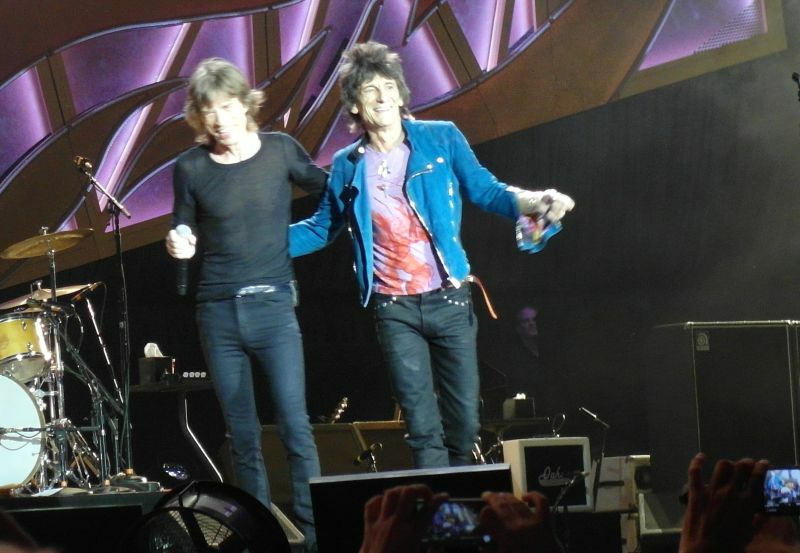 It seems that I am not overstating things, this was just a wonderful big-smiles-all-around Stones concert. In 1995 I was following The Rolling Stones by train in Europe. It was on the train to the Stones show in Zeltweg Austria in the summer of 1995 I met two Japanese Stones fans, also on their way to Zeltweg. During the tour in 1995 we were together show by show, city by city, and we had many great moments that summer. Then I have been on tour all over the world with one of the two friends I made that day on the train ever since, tour after tour, show by show, and we still meet wherever the Stones go. But it was in Austria we met first... Later on I have been at Wiener Neustadt 1998, Imst in the Alps 1999, and then Ernst Happel Stadium 2003 and 2006. Once I got to see the Stones in Austria I had to come back every time. Great crowd and great shows every time. I would never ever miss a Stones show in Austria. Tonight the crowd was unusual silent. Before the show that is... 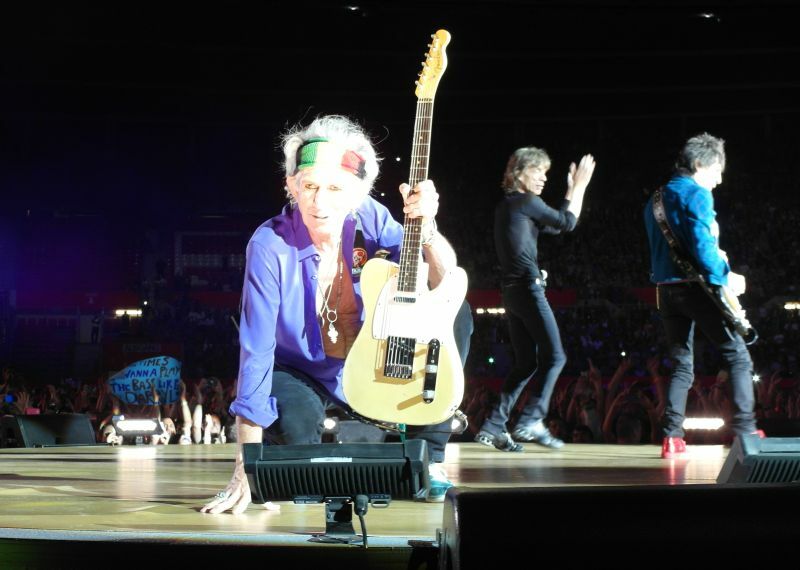 I came from the Paris show three days ago, when the crowd had been so wild and running the wave in the stadium long time before the Stones hit the stage. But something happened by 8:50pm. Ernst Happel Stadium wave was "on". The crowd made noise and the wave was just going around and around the stadium, and there were noise for sure. 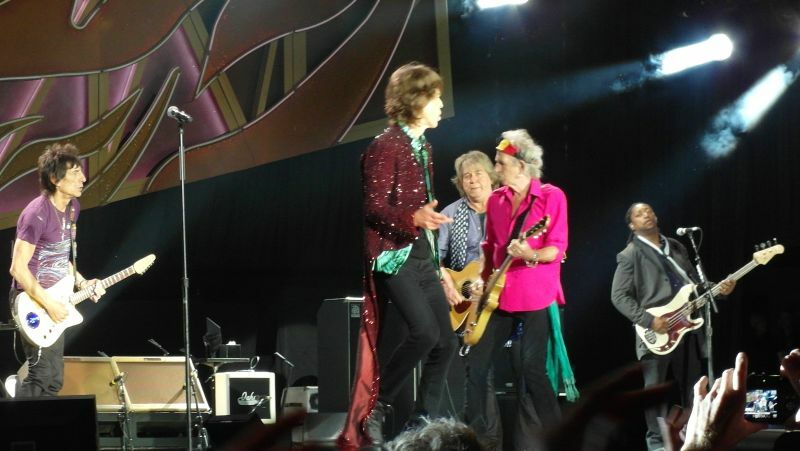 And seven minutes later by 8:52pm the Stones walked on stage and made us all happy one more time in Austria! They play most of the songs of the show every time, and the songs work better and better. "Angie" was the romantic one when couples around me was dancing tight. 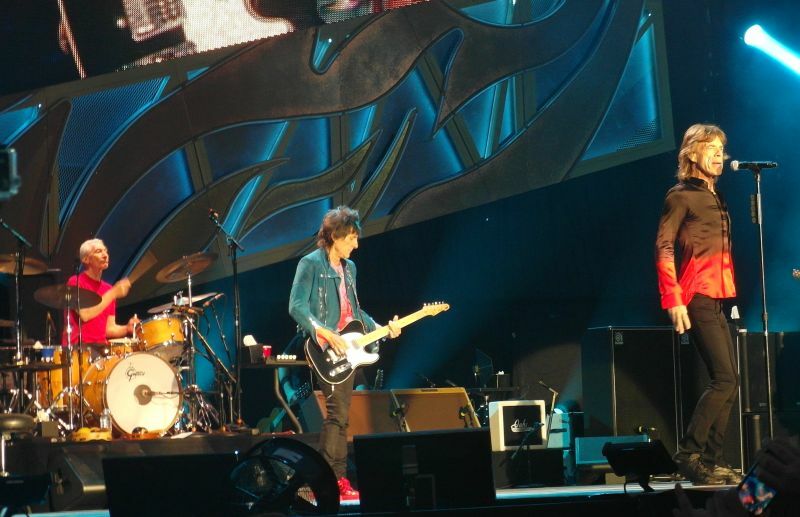 "Out Of Control" and again Mick and Keith seek together to have their time up front of the stage. "Can't Be Seen" with Keith has a great beat, and I was following Charlie on this song. He is all a big smile, his drumming on this song is so basic yet so powerful. It seems like Charlie is enjoying every minute of this song from start to finish. It is like "You Got Me Rocking" - a great beat - and it makes it possible for Charlie to keep a steady up-tempo hard-beating drumming, with a great sound in the mix. The crowd was great and friendly. 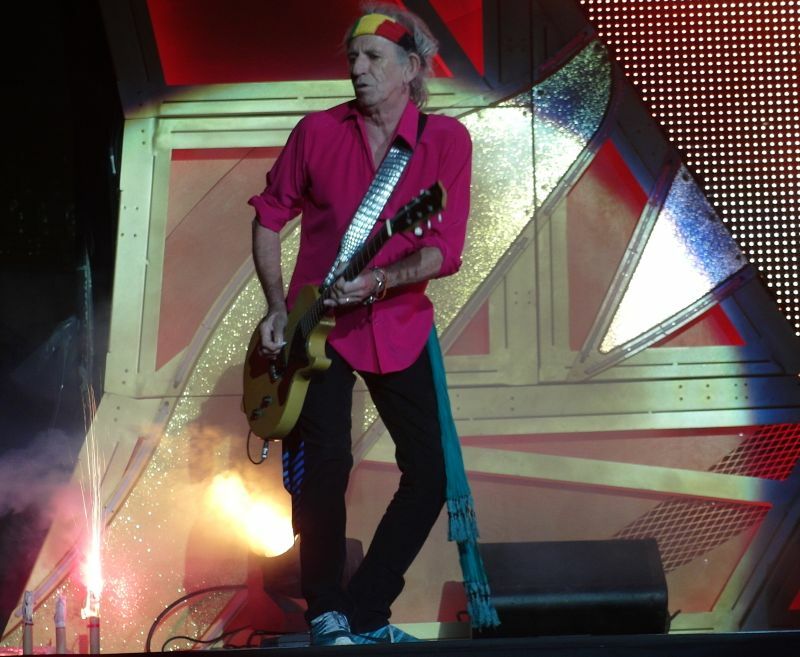 I could easily move from my position up front to the B-stage during "Miss You" and "Gimme Shelter", and then later on to the wing when Keith came there for "Sympathy For The Devil". Then I got my original position in the front part back for the rest of the show no problem. It is aslways a gamle if Keith is going for the left or right wing on his great solo walks, but this time I made it as you can see from one of my photos. Also, when Keith came down to the B-stage during Miss You, he was on his knees right in front of me, all smiles, I wonder if I will see them again on another tour, even if everybody is saying this might be the last world tour. I don't think they are finished yet, judging by all the smiles I have seen on stage this summer. The crowds are different every time during this tour of course, but when people ask me what is the best show, I just have to say they are all great. The band have a great time on stage and the fans are all big smiles. 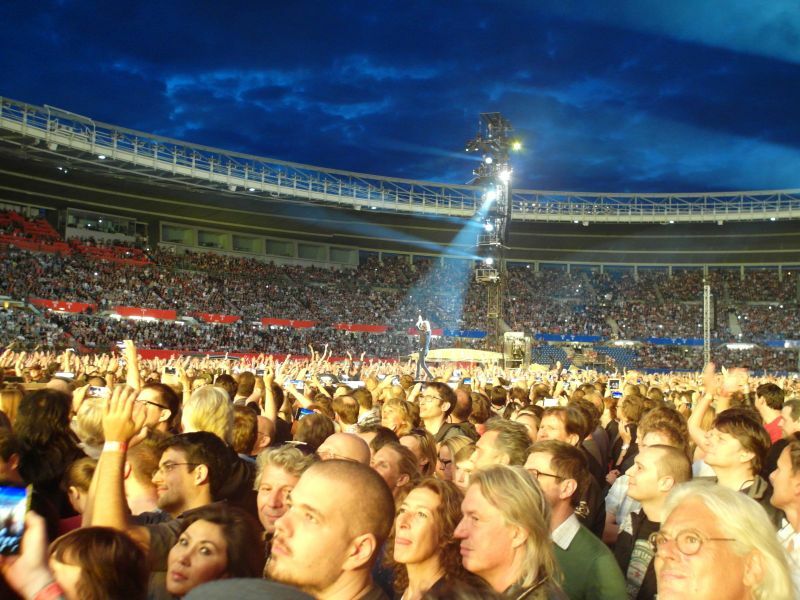 Many fans in the crowds have seen the Stones before, and many travel to see them. It is very true what the local Vienna paper Kurier wrote the day after the show: "Der Grosste Rock-n-Roll-Zirkus der Weld" --- "The greatest rock-n-roll circus in the world! Because I was on holiday when the tickets were sold, I just managed to get a Lucky Dip ticket, which got me into the upper section, sector B, almost next to the stage. I had hoped for a place in the pit, because I feared that the atmosphere up there would be lousy but luckily this wasn´t the case at all. When the stones started, almost everybody was up to his feet, shouted and started to dance. Next to me most people were fans in their twenties, what surprised me a bit. 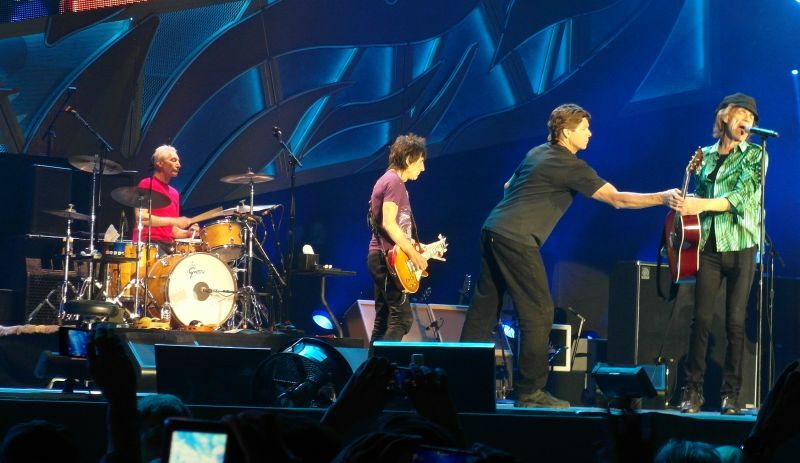 Almost everybody wore a Stones T-Shirt, which was great too. I have seen the Stones the first time 1982, and I enjoyed all their concerts I have seen since then (1990,1995,1998,1999,2003 and 2006), and of course it is hard to judge objective, but in any case they were really in great form and it was great performance. They really were on fire. To me the sound and also the quality of the video walls were very good. Highlights for me were MR, OOC, HTW, JJF, YCAGWYW, and Satisfaction. The version of DG (which I like) was not one of their best, and Keiths Can´t be seen was not so great. Of course there were some minor “mistakes”, but overall I say the musical quality of their performance was high. The guitars were loud and rough, and Mick still moves and dances like a young man. I also appreciated Mick speaking a lot in German. With 3 words: it was great!